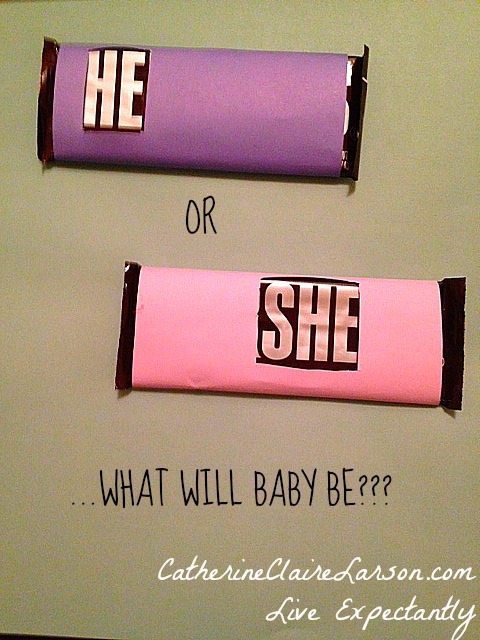 Unwrapping God’s Surprise: Baby Boy or Baby Girl? Well, today’s the big day. We find out (hopefully!) whether we are having a boy or a girl. And while I’d be delighted to repaint the nursery pink, I’ll rejoice equally if we find out we are having boy number three. If you or someone you know is out there expecting a baby, pass this along to them. Because for all of us, (whether we choose to be surprised on the day of birth or find out at an ultrasound), it’s very common to have some degree of gender disappointment or perhaps anxiety. Due to our own family history, we may feel more prepared to care for a boy or a girl. Or the quiet dreams we’ve been dreaming since childhood may revolve around ballet recitals for a sweet baby girl or camping trips with a little boy cub. As I see it, whether you bring home a bundle of pink or a bundle of blue, you can trust that God particularly chose you as the mother of this girl or this boy. God chose this child for you before the foundations of the world. He hand-picked you to parent this little one. This baby’s gender is no surprise to him. And God knows this child particularly needs you as his or her mother. God also knows the world particularly needs this some-day man or woman. The Bible also teaches us that both sexes are made in the image of God. Some of the ways in which men and women reflect the image of God are the same, and some of those ways are different, but taken together they give us a fuller picture of the God whom we worship and enjoy. This child will be a particular glimpse of the glory of God, and God is giving the world in which we live that particular glimpse of his glory for a purpose. Who am I to doubt a God who sees the end from the beginning? Who am I to lament his wise choice? God’s wisdom is perfect. And we wait expectantly to see how he in his wisdom has chosen to bless this family. Little one, we rejoice in you… pink or blue. Want to take a guess? Leave your comment below. I’ll update you after we tell the fam. 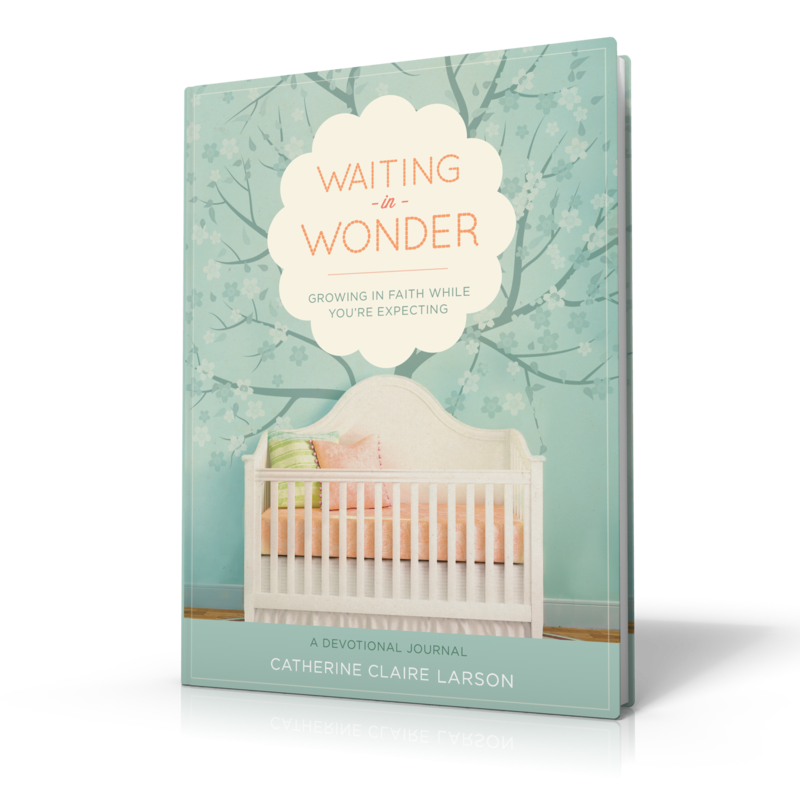 And if you like what you’re reading, consider getting a copy of my devotional, Waiting in Wonder: Growing in Faith While You’re Expecting for yourself or as a gift for an expectant mom you know. Waiting in Wonder Launch Week Has Arrived and A Big Announcement! It’s finally here! My book, Waiting in Wonder: Growing in Faith While You’re Expecting, officially releases tomorrow (April 16th) and I couldn’t be more thrilled. This book was ironically nine months (almost to the day) in the writing. When I began writing it, I was mid-way through pregnancy with our second son. I wrote in little snatches of time: a nap-time here, a late-night, or early morning idea there. It was a series of almost uninterrupted days of simply showing up by faith and asking God to supply the inspiration and the words. And to His glory and my surprise, each day He met me with the manna of a new idea and a few words to say it. About mid-way through the writing, my son was born, splashing joy across the bleak mid-winter days, filling the hearts of his beaming papa, his grinning brother and his melting mama with the excitement that only a new baby can bring. And somehow, even on days when all I wanted to do was cuddle his downy-head or sleep for a few more minutes, I felt God drawing me to set aside a little sacred space of time each day to meet Him on the blank page. And there on my own Mt. Horeb– which looked a lot like a blinking cursor on a white screen–I would find Him, burning with a word for the mamas whom He loves. Don’t get me wrong, I’m no Moses, and this is no holy text, but it is a book that was born in prayer, waiting, and faith. And born, rightly so, in the midst of new life. Now as the book is finally launching nine months (almost to the day) after I turned in the first draft, I’m bursting with the joy and relief experienced by proud mamas everywhere, when they finally hold, and get to share, that treasure that was formed in hidden places and is now brought into the light. And in God’s sweet providence, I’m launching this new book in the midst of a new season of life and waiting. Drumroll please…. I’m getting the joy of filling in the days of my own devotional journal for expectant mamas. In case, you’re wondering I’m on the tail end of week 11, and in case that still isn’t clear enough, YES, I AM EXPECTING AGAIN! Sometime around November 1st there will, Lord willing, be a gasp and cry for breath and a new day of a beaming papa, two grinning brothers, and a melting mama. And so today instead of doing all the things that authors with a book launching the next day are supposed to be doing, I was lying on an examining table listening to the flittering 160 BPM sound of new joy! Praise be to God! So I know you’ll excuse me, if all my ducks aren’t quite in a row on this launch night eve. One of the things I’ve learned along the way is that our Shepherd is gentle with those who have young (Isaiah 40:11). He understands that the ewe with little lambs needs extra care. That’s a word of comfort for all of us mamas, who have more than we think we can handle. The Good Shepherd knows our needs. We can trust Him. I’m trusting Him tonight with all the things that aren’t quite as done or as polished as I’d like. I heard the fluttering of new life today, and that’s enough for me!